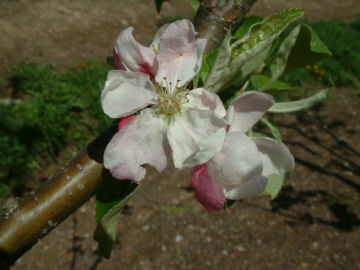 Once a very well known and desirable apple rivaling Red Delicious for popularity, Virginia Beauty is now a rare apple. The apple originated from a seed planted in 1810 in the backyard of Zach Safewright in the Piper’s Gap community of Carroll Co., Virginia. The original tree stood until 1914. 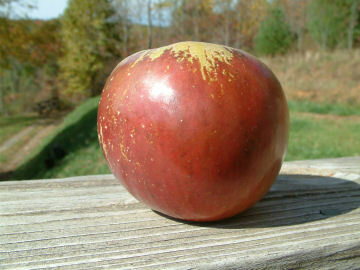 Fruit medium to large, often lopsided, with smooth, dark red or purplish skin. Flesh is greenish yellow, fine-grained, tender and juicy. Ripens October-February and is a good keeper. Oh, I do hope that u have some Virginia Beauties this time. Wolfe Rivers are also. Do u take these apples to the Farmers Market. Would like to buy some virginia beauty apples. Would you be able to ship to Tennessee when they come in in the fall? I would order trees but have not had any luck with the varieties that we’ve planted in the past.